(Nanowerk News) A newly developed elastic gel administered in liquid form and shown to turn jellylike within minutes after injection into rabbits’ eyes to replace the clear gelatinous fluid inside their eyeballs, may help pave the way for new eye surgery techniques, says an international team of researchers led by Japanese scientists (Nature Biomedical Engineering, "Fast-forming hydrogel with ultralow polymeric content as an artificial vitreous body"). Various retinal diseases, such as retinal detachment, require surgery to replace the vitreous, the gel-like substance that fills the space between the retina and the lens in the eye. While gas and silicone oil have conventionally been used as substitutes for vitreous, these materials do not mix well with water and are not suited for long-term use. In contrast, hydrogels—elastic gels with high water content—are promising materials because they are composed of substances similar to those found in soft tissues in our body and mainly consist of water. Sakai and his collaborators at the University of Tokyo and the University of Tsukuba developed a hydrogel with a low polymer concentration that could be introduced into a rabbit’s eye as a liquid and capable of gelling within 10 minutes after injection to replace the vitreous. The scientists were able to accelerate the gelation rate by breaking the reaction into two steps: First they mixed two types of four-armed polymers to create highly branched polymer clusters in liquid; then the polymer clusters were prompted to aggregate once they were injected into the eyes. The swelling pressures of hydrogel-treated rabbits exhibited no significant differences from those treated only with salt water. In addition, the hydrogel-implanted rabbits showed no signs of side effects, even after 410 days of treatment, suggesting that the new material is not rejected by the body and safe. In a separate experiment, the scientists showed that rabbits affected with retinal detachment recovered once they were treated with the new hydrogels. “Hydrogels are promising biomaterials, but their physical properties have been difficult to control. We wanted to show that these difficulties can be overcome by designing molecular architecture precisely and I think we’ve been successful,” comments Sakai. 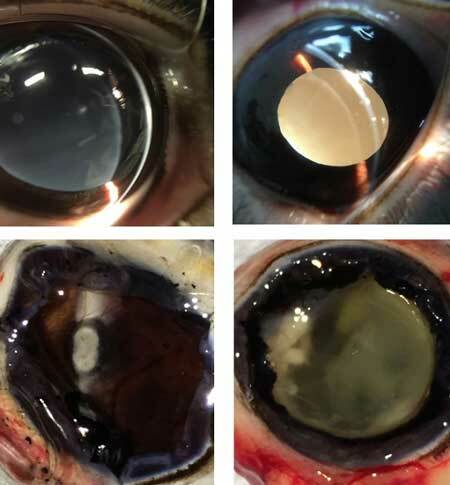 While the efficacy and safety of this new hydrogel still need to be tested in humans, the researchers believe that it would free patients from having to keep their head stabilized in a face-down position after vitreous surgery, a procedure necessary for the injected silicone oil or gas bubbles to push the detached retina. The hydrogels’ properties may also make them suitable for broader applications to treat a wide range of conditions as a space-filling gel to replace soft tissues damaged by trauma, tumors and degenerative diseases.